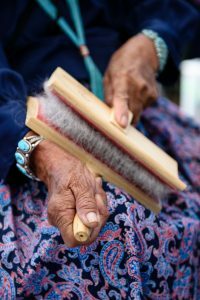 Dine Be’ Iiná is dedicated in promoting economic self-sufficiency with sheep wool and sheep culture. 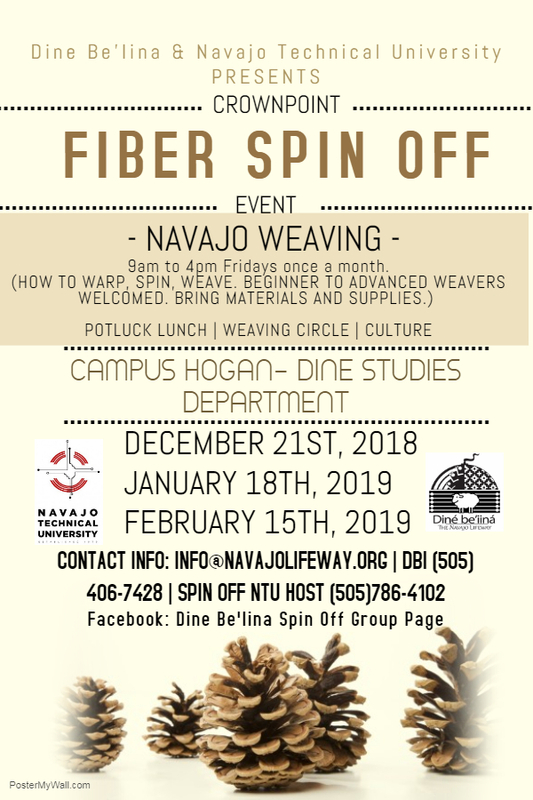 Seasonally, across the Navajo Nation small communities gather to share fiber projects and create value added wool pieces. 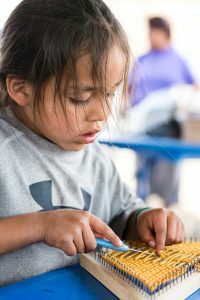 Spin offs are informal groups of sheep herders and wool/fiber enthusiasts that meet monthly to exchange knowledge about sheep herding, hands on learning of new fiber art techniques and anything that connects to the Navajo pastoral lifeway. 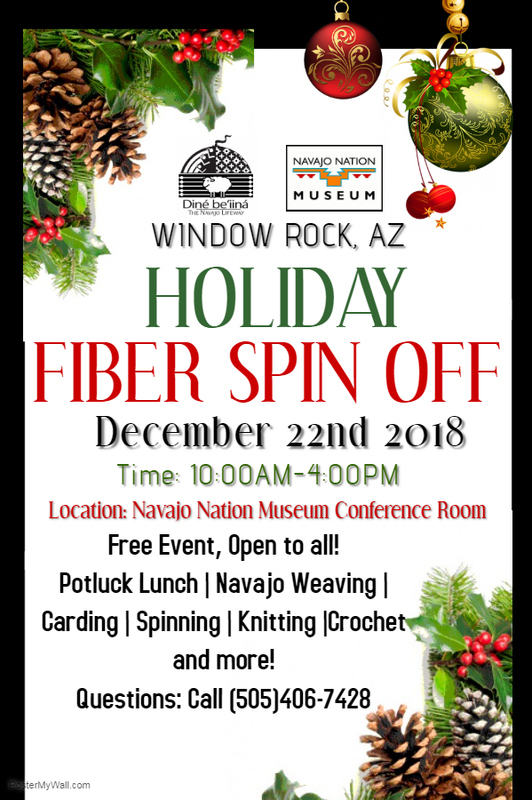 Communities learn various topics of involving wool, hand carding, wool spinning, felting, wool dyeing, to Navajo weaving and many more. We understand, many individuals are also interested in hosting their own Spin Off in their community, please give us a call, we can help you start! Call (505)406-7428 for more information on host, locations/time, subject to change anytime. All Spin Off Groups are volunteer-operated, please bring a dish/drink/refreshments to share along with your knitting, weaving tools. Thank you! WINTER Sessions begin Sept. 13 , 2018 from 4:30 to 7:30pm. Meets every 2 weeks on Thursdays. NOTE: Dates are subject to change! Please call host before attending. Beclabito Day School, FACE Classroom. Potluck Dinner. Meets the second Sunday of every month. Meets every 4th Saturday of every month. Click here for flyer and schedule. An all volunteer event, donations welcomed! www.navajolifeway.org | info@navajolifeway.org | (505)368-3975 /406-7428. Are you interested in becoming a host or starting a Spin Off Group in your community? 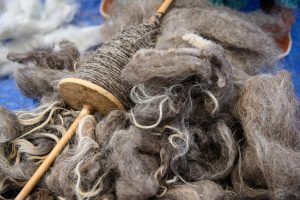 Whether you are a seasoned or active spin off host or new to the concept, take some time to look over our guidebook to begin what it’s like to start a fiber arts group in your community! A comprehensive guide to what you can expect as a host and how DBI can play a role in your spin off group. It also details information on policies regarding safety and participants attending. Includes a Spin Off Host agreement and other important information to make your spin off a success! Contact DBI if you have questions at (505)406-7428. There is no registration required to attend. If you have any questions or concerns with the event, feel free to contact us anytime.